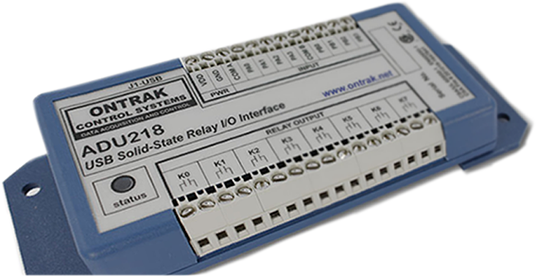 By email to: val@ontrak.net Include part number, quantity required, delivery address and telephone number. We will then contact you with payment options. PAYMENT VIA CHECK, MONEY ORDER, VISA , MC, OR APPROVED P.O. All international orders are shipped from Canada via Fed-Ex ($50-$70US for 1 to 2 units for most EU countries). Pricing for international orders is in US funds and payment may be made by VISA, MC, bank transfer or certified cheque. Send e-mail for specific quote and delivery time. 1. Orders may be sent by email if desired. Please include Contact name, Delivery Address, telephone Number, and QTY and Part #'s required. We will respond to the email, usually by telephone to obtain payment information. This also ensures we have a valid email address to send order tracking information. 2. Shipping prices are for continental U.S. Alaska and Hawaii slightly higher. ADU products shipped with 10' A-B USB cable. Drivers and SDK can be viewed or downloaded on the Programming Section of this webiste.